Actor Denis O’Hare, who played vampire Russell Edgington on HBO’s True Blood, has announced that he and his husband are adopting a baby. Mr. O’Hare married Hugo Redwood last year in New York, and the happy couple is close to obtaining full guardianship of their foster son. Mr. O’Hare says the boy is seventeen months and has been living with them since he was two weeks old. The True Blood nursery is filling up, since Anna Paquin (Sookie Stackhouse) and Stephen Moyer (Bill Compton) welcomed twins earlier this year. Congratulations to all the new True Blood parents! Denis O’Hare played 3,000 year old vampire Russell Edgington onscreen for only two seasons, but his presence definitely colored a third. Mr. O’Hare says that he had a great time working on HBO’s True Blood, but there was no question that it was Russell’s time to die. The love story between Russell and Steve Newlin (Michael McMillian) made working on Season 5 a pleasure, and Mr. O’Hare can’t rule out a Godric-esque flashback for his character, but he maintains that true death at the hands of Eric Northman (Alex Skarsgård) was right. The final moment of Russell’s life pleased Mr. O’Hare. He enjoyed the disappointed but accepting reaction. Mr. O’Hare believes that Russell has lost the enjoyment of living and the pursuit of power simply is no longer enough. His attachment to Steve Newlin was pleasant, but simply not enough. Mr. O’Hare says that one of the most enjoyable things about Season 5 was working with Michael McMillian. They worked well enough together to be able to improv and adlib scenes and dialog. While much of it was edited out, there were still many things that made it to the screen. How did you feel upon witnessing Russell’s true death? Share your thoughts in the comment section below. True Blood actor Denis O’Hare never seems to fail to exert his power over others: from the chaos-inducing, fairy blood-loving, 3,000-year-old vampire in True Blood to the voice of justice as a judge on The Good Wife, he sure makes others listen! However, even with his busy career, he still makes time for Twitter! On August 28th, Mr. O’Hare tweeted a funny photo of himself and The Good Wife co-star Linda Emond and co-star and episode director Josh Charles. 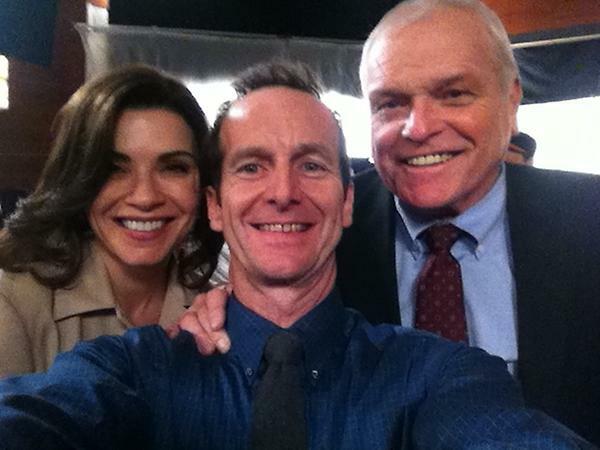 He then posted another picture of himself with other fellow actors Julianna Margulies and Brian Dennehy two days later. Denis O’Hare will be reprising his role as Judge Charles Abernathy now that his True Blood-filming days have come to an unfortunate end. He was seen on six other cases on The Good Wife from 2009 to 2012, so we’re sure glad to see him back! No details have been released regarding this particular episode as of yet, but we’re hoping maybe he’ll have an encounter with Carrie Preston, also seen on True Blood as the sassy Merlotte’s waitress Arlene, who also had a six-episode experience on The Good Wife as Elsbeth Tascioni, an eccentric lawyer. What will Denis O’Hare bring to the courtroom? The Good Wife Season 4 begins Sunday, Sept. 30 at 9 p.m. ET on CBS. Tune in to find out! HBO has released a full minute and a half long trailer for Season 5 of its series, True Blood. Through a combination of scenes from upcoming episodes and character voice over, it provides the major story arc fans will be following this year, and still manages to ask more compelling questions about what is to come. For better or worse, Eric Northman (Alexander Skarsgård) and Bill Compton (Stephen Moyer) have joined forces, but remain on bad terms with Sookie (Anna Paquin). The two vampires find themselves in the middle of a battle between the newly freed Russell Edgington (Denis O’Hare), and the previously unseen Vampire Authority, fronted by Roman (Chris Meloni). Steve Newlin (Michael McMillian) is back, and appears to be advocating for the cultivation of humans for vampire consumption. It looks like Jason Stackhouse (Ryan Kwanten) will have something to say about that. The HBO trailer for True Blood’s Season 5 contains brief scenes of Eric Northman in period clothing. That means fans will be getting flashbacks and back story! Alcide Herveaux (Joe Manganiello) is back, once again looking out for Sookie. There is a brief scene of Eric and his progeny, Pam (Kristin Bauer Van Straten) in bed together. Is it a current scene or a flashback to the time of her turning? Still, the biggest question that needs to be answered is asked in the very first scene of the trailer: What becomes of Tara Thornton (Rutina Wesley)? Take a look for yourself! What do you think is in store for Season 5? What burning question do you want to have answered? 30 Days to True Blood Season 5 — Russell! Less Than 30 Days to True Blood Season 5! The posters are out for the HBO True Blood stars for season five! There will be one for each actor and we at TrueBloodNet.com have decided to present one per post in order to give each it’s own top billing. Two seasons ago Denis O’Hare burned up the screen as Russell Edgington the Vampire King of Mississippi. But Vampire Bill and his new buddy Eric Northman, with the help of Sookie‘s blood burried Russell under several tons of cement after Eric killed his long-time lover: Talbot in an act of long awaited revenge for the king slaughtering Eric’s family. We can hardly wait to see how Russell got free and how he’s going to mix it up! Call your friends, the party will be ON in season 5 of True Blood. Denis O’Hare, who plays the Vampire King of Mississippi Russell Edgington in HBO’s series True Blood, has recently adapted Homer’s epic poem, ‘The Iliad’, for the New York stage. Collaborating with friend, Lisa Peterson who also directs, O’Hare wrote, and plays the leading role in this one-man play, ‘An Iliad’. Stephen Spinella (Angels in America) alternates performances with O’Hare. ‘An Iliad’ officially opened March 6 with O’Hare and March 7 with Spinella at New York Theatre Workshop, 79 East 4 St., NYC. 212-460-5475. The actor who plays our delightfully villainous Russell Edgington in True Blood and the pernicious, grotesque and suspicious Larry on FX’s American Horror Story has another trick up his sleeve: he’s co-written a play based on Robert Fagle’s English translation of Homer’s infamous Trojan War epic, The Iliad, with respected director Lisa Peterson. Since 2005, the two have crafted “An Iliad” into a one-man show, out of the epic, that originally opened in 2010. O’Hare has not acted in it so far, due to his TV/film commitments, but plans to alternate with the lead star (Stephen Spinella from Angels in America and Spring Awakening) in the New York Theatre Workshop’s run beginning in February 2012. In the Chicago production, currently running at the Court Theatre, “The Poet”, here played by Timothy Edward Kane (The Illusion, Rock ’n’ Roll) was cast by the Court’s artistic director Charles Newell. O’Hare, Peterson and Newell discuss much more in an interview (which discusses the play, O’Hare’s personal life, etc.) in the Windy City Times and I would highly suggest all Truebies check it out and let us know what you think in the comments section! So until then Truebies, check him out on FX in American Horror Story, Wednesdays at 10pm.